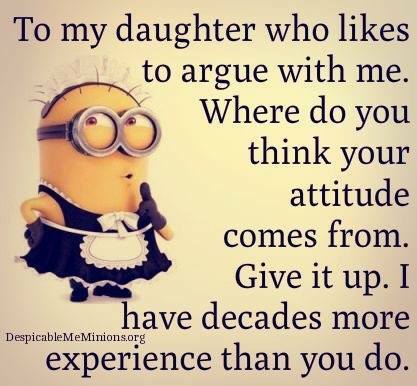 TO MY DAUGHTER WHO LIKES TO ARGUE WITH ME. WHERE DO YOU THIN - ProudMummy.com the Web's Community for Mums. TO MY DAUGHTER WHO LIKES TO ARGUE WITH ME. WHERE DO YOU THINK YOUR ATTITUDE COMES FROM. GIVE IT UP. I HAVE DECADES MORE EXPERIENCE THAN YOU DO. I know what I know and won't argue! Remember this!!! I have 2 and a half more decades experience than you! Just showed this to my little madam...we looked at it each other and started laughing. Very true my daughter always agree with me when I goes wrong. True that Keara Shelley, GIVE UP!!!!! Wendy Nichols although you don't admit it. I get it from you! Layla Jackson and yet you would still face off against me. Millie Wood Maddie Wood U should just give up!!? Esmé Kennedy one for HRH!!! Clare Weekes tell D !! Angie Oleary & Poppy O'leary! !